The Model 550D Single Vertical Jet Electropolisher is designed to perform damage free thinning of materials for subsequent analysis in a Transmission Electron Microscope. 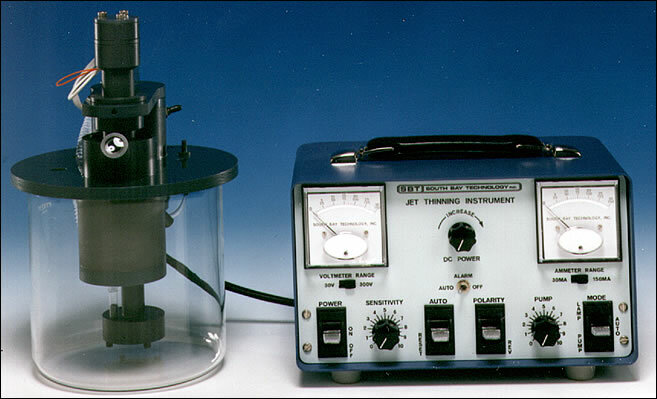 This extremely versatile instrument can be used to thin metals and alloys electrolytically with corrosive electrolytes such as perchloric acid at low temperatures; or to thin nonmetals and semiconductors such as silicon and gallium arsenide, chemically, using nitric acid, hydrofluoric acid or bromine-methanol solutions. Any solution that does not harm the PVC plastic, or the glass or plastic reservoirs can be used.